I have heard so many times from including my husband that you can't make a beagle a pet and a hunting dog. They need to be one or the other. What's your input on this one? Tell your hubby he's wrong again! That is a totally false statement. I have my Belle dog in the house as well as a new pup not yet old enough to hunt, but Belle is a hunting fiend. I've seen alot of beagles run. I've seen alot of dogs who are better rabbit hounds than Belle, but I have yet to see a beagle who has more hunt and desire to find and run down a rabbit than my Belle. Hunt and desire are either bred into or out of these hounds. Keeping them in the house and all the loving them up in the world isn't gonna make a hunting beagle not want to hunt. There are those that do breed beagles totaly as show dogs or pets. So if you are wanting one for both a pet and a hunting hound make sure you buy from a breeder who advertises hunting beagles. Ask this question in the "Just Talkin Dawgs" section and you'll get more responses. Sometimes it is a benefit to have them in the house...builds a bond between hunter and hound......If the pup has any hesitation around people the home environment can help them grow through it. And also.....Beagles are pack animals..they love the attention from both adults and the kids....Both the children and the beagle will benefit from the exposure to the family atmosphere. Alot of how the hound turns out to perform in the field will depend on how much TIME THEY SPEND IN THE FIELD RUNNING RABBITS AND TRAINING.....( all caps for a reason ) The reason...You can not have a beagle stuck in a dog house or kennel or in the home for 10 mos...take them out hunting and expect them to blow the barrel off the gun by running rabbits to perfection..they need time in the field to keep them in shape and to hone their running skills. This is a must as It will save alot of head aches on the hunters part. Last edited by high ridge joe on Thu Oct 01, 2009 5:22 pm, edited 1 time in total. Did you wind up cutting him? We keep our pup in the house and the extra training from our kids help. ie: Sit, stay, fetch, let go... He's 8 months old now and an excellent hunter. He loves to please us and LOVES to hunt. He even fetches the rabbit and knows commands like come, stay, wait, let go and fetch. We can point to the brush or where ever we want him to go and he does it and he stops to check on us and waits for us to give a command because we know each other so well. He's fun to play with, loving and protective. He's priceless to our whole family. He's a wonderful pet, friend and hunter. He's very serious when it comes to hunting. It's fun to watch him when we get the boots out or the gun. He gets very excited and goes and sits by the door and cries between checking on our progress getting ready. Or we can just ask him if he wants to go hunt a bunny for the same effect! I have two beagles that are house dogs and hunting dogs. I wanted them to be family pets that will hunt with me and my sons. It has worked out good so far as we have had some great hunts and shot many rabbits with them. I did have one experience that made me think twice about this though. Last October I was invited to hunt on Drummond Island. My dogs are 2 and 4 years old and I have had them since they were pups. Both hunt well and are great family pets. We have always hunted conttontail so this was my first time hare hunting. I new what to expect from what I have read and what was told to me by the one who asked me to go. The day I arrived the guys were late getting back because they had lost a dog and it was so spooked it would not come back. We found him the next day but he did not hunt the rest of the week that I was there. ( I have heard since then that he is well and back to hunting). This did not concern me much, but then the next day we went out hunting and the dogs got on a rabbit that ran them clear out of hearing. They returned chasing the rabbit and eventualy I was the one who shot it. My older dog was with the pack and I saw him then, but my younger one Max did not show up. We figured he was with the rest of the dogs and continued to hunt. At the end of the day we rounded up the dogs but could not find Max. We got out the receiver and could not get a signal. To make an already long story shorter we searched for him and spread the word about him but he was not found for three days. Because he is a family pet it was upsetting to everyone in the family, even my Mom, who was glad she did not find out about it until after we got him back. 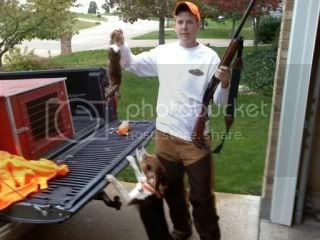 I explained to my family when I decided to get the dogs for hunting that things like this could happen. If you are going to hunt your family pets just make everyone aware that sometimes dogs get lost, hurt, and unfourtunely even die while hunting. We take all the right precautions and conitue to enjoy hunting with them. Everything has its risks and rewards. they absolutely make better hunters if raised in the house ! !